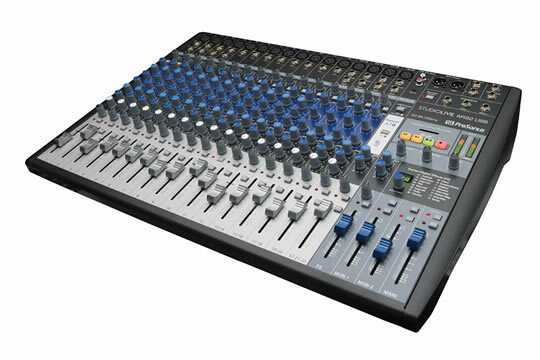 StudioLive AR22 USB 22-channel hybrid mixers make it simple to mix and record live shows, studio productions, band rehearsals, podcasts, and much more. This is a musician's mixer: lightweight, versatile, feature-rich, and packed with analog connections and digital tools, yet easy to learn and use. Mix with 16 of PreSonus' famous Class A preamps and three-band EQ. Create multitrack recordings and fly in backing tracks with a 24-bit, 96 kHz, USB 2.0 digital audio interface. Record and playback in stereo with the integrated SD digital recorder. Stream program music wirelessly, using onboard Bluetooth. Compact and road-ready, StudioLive AR mixers provide a superior all-in-one solution for mixing and recording your performances. Most mixers make you route acoustic and electric guitars and basses through external direct boxes before connecting to a mixer input. But with StudioLive AR mixers, Channels 1 and 2 have high-impedance instrument inputs, so you can plug a guitar or electric bass straight into the board – no direct box needed.